Dimensions vary between 3 x 3 cm & 4.x 3.5cm. Increase your Arts & Crafts collection while improving the learning quality for your pupils with our Foam Letter Shapes Lower Case. Manufactured from high-quality and gently soft foam, each letter has a bright, vibrant colour to attract the eye and is sized perfectly for smaller hands. Their high liquid retention makes them perfect stamping tools with paints or ink alongside being an effective tool for teaching the different strokes required for individual letters. 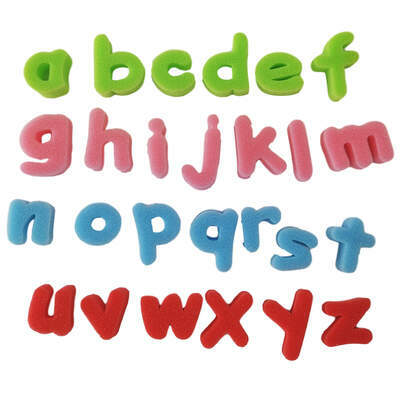 This all-encompassing pack features all 26 foam letters of the alphabet in an assortment of colours and is sure to become well-loved within any educational environment.